Buy Time Together & Togetherness English $199.95 $179.96 Daily transit interpretation report! Buy Time Together and get Togetherness free. The Time Together report is the first ever to offer daily transit interpretations for a relationship as a whole, making it possible to track the couple's compatibility through time. Well, a master astrologer, John Townley, discovered it in the early 1970s. Called the Composite Chart, this chart represents both people in a relationship by combining the two charts (using the standard midpoint between each set of planets) into a single chart. 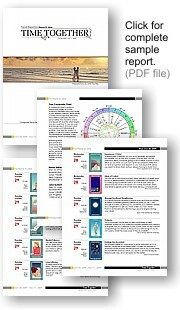 Townley not only discovered how to use the composite chart, but he popularized it until today this chart is used by astrologers all over the world to track relationships of all kinds – romantic and otherwise. Select start date for your report. An average Time Together report will run from 10 to 30 pages, dependent upon numbers of weeks selected. Time Together is a complete program that will function as a stand-alone or in conjunction with other Matrix programs. Reports in the Win*Writer Professional collection work within the same user window making it easy to produce multiple reports quickly and efficiently either individually or in convenient batches.